Rainbow Moonstone is a gorgeous Feldspar based mineral, with a lovely flash of colour. It is usually used for jewellery, or polished into display items. It should not be confused with Moonstone – which does not have play of colour. This stone is often confused with Moonstone, due to the similar names; people believe the stones are related, but they are not. Moonstone is a form of Orthoclase (Potassium Feldspar), whereas Rainbow Moonstone is closer to Labradorite (Plagioclase Feldspar) – albeit a white variety. The name does cause some confusion, and to make matters worse, many unscrupulous sellers sell the glass “Opalite” as either Moonstone or Rainbow Moonstone, although it is easy to tell the difference with a little experience. Typically the rainbow variant is mostly clear or white, and has a blue flash of colour, but other colours do exist – gold is probably the second most common. Rainbow Moonstone is typically used for jewellery, cut into cabochons and set into necklaces, rings, pendants or earrings. It can also be found tumbled, or polished into decorative items like spheres and eggs – however, rough pieces are surprisingly hard to find. They are found in a few places but the biggest deposits seem to be in India, Madagascar, and Canada. Technically speaking, Rainbow Moonstone should have the same characteristics as its relative Labradorite. It is thought to bring balance and harmony to situations, and some believe it can help with the digestive system. 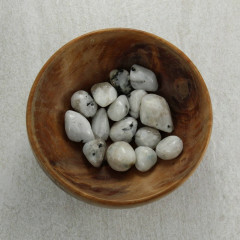 It may be even more potent during the full moon, and many people leave the stone outside to charge during the full moon. It is used with the Sacral or Crown chakras.